Rachel's First Hypnobabies Hospital Birth! Rachel’s First Hypnobabies Hospital Birth! 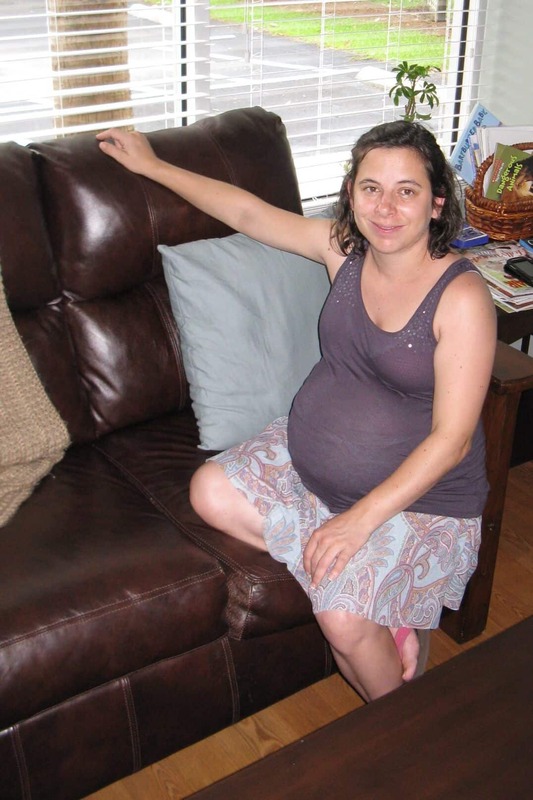 When I was pregnant with my first child, Duncan, I went to La Leche League meetings to learn about breastfeeding. In one of the meetings, women shared their birth stories. Several women had natural childbirths, several women had the epidural standard births, and two women sobbed as they relayed their nonstandard epidural births. I truly felt for those women and also believed that the natural childbirth women were a little too far onto the zealot scale for my taste. What an interesting experience to be able to reflect on when I became pregnant with my second, Violet. My first birth was one of those horrible nonstandard epidural births. I had an epidural that didn’t work and a long birthing time (34.5 hours). After the three month mark of my pregnancy with Violet, I became terrified. The thought of enduring a similar birth as Duncan’s was overwhelming. Here I was three months pregnant and looking at a C-section or natural (zealot) birth. I went on a researching campaign and read at least seven books about natural childbirth including several midwife textbooks. I read these books, talked with a midwife and then watched amazing births using hypnosis on youtube. I cried many times because Duncan’s birth was scary and filled with my ignorance while these birth videos were so beautiful. I wished that I’d had a doctor, family, or friends that could have educated me about my decisions for childbirth. I had to have the hypnosis birth so I called Kerry Tuschoff at Hypnobabies and purchased the Home Study course. I started practicing at 26 weeks and almost did everything exactly as written in the books. The Home Study requires self-motivation and luckily I knew what “unprepared” could look like so I was obsessed. An unexpected benefit from Hypnobabies was the astounding ability of the scripts to remove all of my fears and anxiety about childbirth while instilling in me the confidence that I could do it differently. I will also add that the daily affirmations really did help me feel that my pregnant body was beautiful. The materials really cleared out all of my other concerns and allowed me to love pregnancy fully. regular intervals. When my husband woke up I told him that I thought it was the day and we were very excited. I went into the bedroom and tried out different positions with the birthing ball, but it seemed like I “lost” the birthing waves (contractions). My husband found me crying in the bedroom and was very supportive. I decided to do one of the scripts that works on removing fears and then we went on a walk. We walked around the neighborhood for at least an hour in ninety degree heat. We decided to go home and call my family who was planning on attending the birth when the pressure waves were fairly consistent between five and eight minutes apart and lasting a minute and a half. My sister came over immediately and we again went out walking. It seemed as soon as I walked into my house the intervals would get wider apart and I wanted to help my body to shorten the labor time. After another hour and half of walking, the pressure waves were getting more intense and I would have to stop walking and concentrate. We went home for a late lunch. My favorite position was being on my knees and elbows with my stomach in the middle in deep hypnosis with my husband pressing on my hips. We headed to the hospital when my pressure waves were between four and six minutes apart. I put my ipod on in the car and listened to the easy first stage script (a Hypnobabies track). I counted 8 pressures waves in the twenty minute drive and was increasingly astonished that I was feeling no pain. Let me be clear, it was definitely my birthing time. My stomach would round into a hard ball, and I could feel my muscles pulling at my hips and my lower back more than I have ever noticed before. After parking the car, I remember walking to the hospital with my family joking and laughing. We would stop every time a pressure wave started so Kevin, my husband, could apply pressure to my hips and I could count myself into hypnosis. The receptionist at the hospital seemed astonished when I refused a wheelchair and asked where the stairs were. I refused to have another birth that lasted over a day. When we got to labor and delivery at the hospital, the natural childbirth rooms were unavailable. We were shown to the antepartum room where I was checked and a fetal test strip was done. I used the easy first stage track during the fetal monitoring. Then we started walking the halls. We would walk and then stop with a pressure wave. I would lean on the walls and then my husband would apply pressure to my back. Occasionally I would return to the antepartum room to chug some water and go to the bathroom. I was really trying to avoid the IV. After two hours of waiting, I was admitted and then I went into the tub. Oh boy, do I love the tub during childbirth. At this point, the birthing waves were coming pretty close together roughly between two and three and half minutes apart. I spent the majority of the time in hypnosis on my knees leaning forward against the wall of the tub. It required all of my concentration at this point to be on top of the waves so they would not become painful. I remember telling Kevin that I needed him to remind me to fully relax my abdominal muscles during waves and asking him to help me with the “peace” and “relax” cues. The nurse came in a couple of times to check on us and Kevin did all the talking. My sister and mother would come and go. The nurse only checked the baby’s heart rate once for a minute. It is always amazing and wonderful to hear the heartbeat and to be assured she was doing fine. Violet was pretty motionless during the birthing time unlike her brother who was trying to kick his way out. A couple of times, the wave would start painfully, but we were able to catch up using the cues. I remember one time wondering how I was doing. My mother and sister were sitting on chairs, drinking coffee, chatting, and knitting. It was comforting to know that this birth was going so peacefully they could relax. I took their behavior as a sign that everything was working perfectly and it rejuvenated me. I know that at some point, I started saying “peace” aloud and “open open open”. Soon after that, my mother came over to check on us and I told her something was happening and I need to move. I could feel my body changing and even a sense of bearing down even though I wasn’t actively pushing. As my mother and husband were trying to help me out of the tub, the nurse came. They explained what was happening as I tried to sit on the toilet. This was a bad move. I wasn’t able to concentrate enough when leaving the tub and while attempting to sit down I had another powerful and this time painful birthing wave. My husband could not immediately apply pressure and I was unable to use my hypnosis cues. I had at least another birthing wave on the toilet before I realized that going to the bathroom was not going to be possible. Friendly advice: every mom that I know who thought they had to go to bathroom at this point really had to deliver a child. I made it to the bed became terrified of lying down and ended up on my hands and knees and was immediately began to use hypnosis again. Almost miraculously the doctor appeared and did a cervical check. I guess he said “you can push.” I asked my mother if he said “the baby is never going to come.” I guess that’s transformation (Hypnobabies word for transition) for you! I was happy to be entering in the next stage so I began to push using exhale pushing and I had no problem using my voice. Oops, I didn’t really share this plan with my sister and my mother and apparently they became afraid that I was in a lot of pain. dramatic as any Hollywood video if not more dramatic. I continued pushing with the addition of my birthing ball to lean onto. At one point, the doctor told me the position wasn’t working and wanted me to lay on my side. Once I laid down, Violet’s head was out with one birthing wave. I had to stop because the cord was around her neck and impeding her progress. She wasn’t purple, it just wasn’t long enough to let her all the way out or long enough to slip over her head. The doctor had Kevin cut the cord and she was out in what seemed like a second. She was soon in my arms and nursing like a champ. We successfully delivered in comfort without medicaiton, tears or abrasions! Dr. M. and the labor and delivery nurse were amazing. Dr. M. never suggested pain medication to me, did not break my amniotic sac, and apologized for having to cut the cord. It was an AMAZING birth.